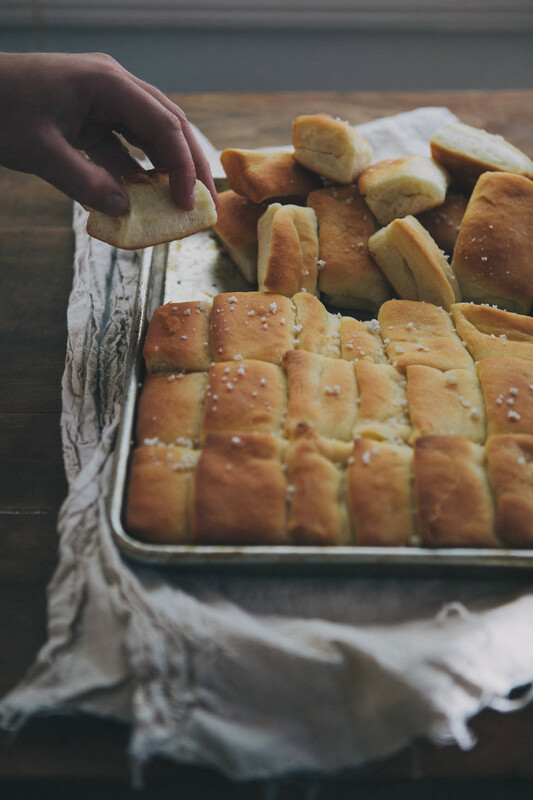 Parker House Rolls — always with butter. Whisk 1 envelope active dry yeast and 1/4 cup warm water (110°-115°) in a small bowl; let stand for 5 minutes. Heat 1 cup whole milk in a small saucepan over medium heat until just warm. Combine 1/4 cup vegetable shortening, 3 tablespoons sugar, and 1 1/2 teaspoons kosher salt in a large bowl. Add warm milk; whisk to blend, breaking up shortening into small clumps (it may not melt completely). Whisk in yeast mixture and 1 room-temperature large egg. Add 3 1/2 cups all-purpose flour; stir vigorously with a wooden spoon until dough forms. Knead dough with lightly floured hands on a lightly floured surface until smooth, 4-5 minutes. Transfer to a lightly oiled bowl; turn to coat. Cover loosely with plastic wrap. Let stand at room temperature until doubled, about 1 1/2 hours. Preheat oven to 350°. Melt 1/4 cup unsalted butter in a small sauce-pan. Lightly brush a 13x9-inch baking dish with some melted butter. Punch down dough; divide into 4 equal pieces. Working with 1 piece at a time, roll out on a lightly floured surface into a 12x6-inch rectangle. Cut lengthwise into three 2-inch-wide strips; cut each crosswise into three 4x2-inch rectangles. Brush half of each (about 2x2-inch) with melted butter; fold unbuttered side over, allowing 1/4-inch overhang. Place flat in 1 corner of dish, folded edge against short side of dish. Add remaining rolls, shingling to form 1 long row. Repeat with remaining dough for 4 rows. Brush with melted butter, loosely cover with plastic, and chill for 30 minutes or up to 6 hours. Bake rolls until golden and puffed, 25-35 minutes. Brush with butter; sprinkle flaky sea salt (such as Maldon) over. Serve warm.